Trending at $30.95eBay determines this price through a machine learned model of the product's sale prices within the last 90 days. The shoes show normal wear. We offer fast shipping and friendly service. 2nd item ships free. Please check our other auctions! These shoes have been worn! They are a pair of pink shoes. The shoes are dirty because they have been in the bottom of my closet for so long. They are a sizeGirl's 4. 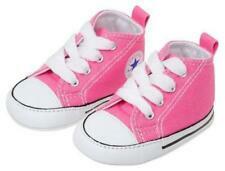 Infant Baby Girl Pink Converse All Stars Chuck Taylor Shoes Size 4 Sneakers. Condition is New with box and tags. Shipped with USPS First Class Package. Black Converse All Star Chuck Taylor Infant Size 4. Condition is Pre-owned. Shipped with USPS Only work by a non walking baby so not really any wear on the bottom! Infant converse shoes Size 4 new in box baby shower first birthday. Condition is New with box. Shipped with USPS First Class Package. Toddler Converse Chuck Taylor All Star Shoes. Size 4c. Condition is Pre-owned. Shipped with USPS First Class Package. Tan with coral ruffles only worn twice toddler converse Size 4, Coral And Tan, Ruffles. Condition is Pre-owned. Shipped with USPS First Class Package. Converse Size 4 Toddler MINT . Condition is Pre-owned. Shipped with USPS Priority Mail. Lots of life left. Dirty footbeds from wear. No stains on outside canvas. 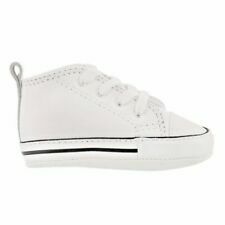 Converse All Star Infant Toddler Boys Size 4 White Leather High-top sneakers. Condition is good all around except for the bottoms that are a bit dirty. Shown in photos. Shipped with USPS First Class Package. CONVERSE All Star Pink Sneakers Size 4 Toddler. Condition is Pre-owned. Shipped with USPS Priority Mail. The Converse Infant First Star Black is made of durable and easy to clean canvas, with leather soles. The soft sole style is light weight and simple to put on. The softer soles help with foot flexibility and doesn't impede infant growth! 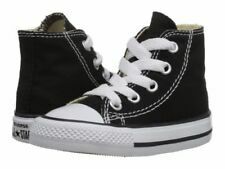 You are looking a a pair of Converse All Star Chuck Taylor toddler shoes in size 4. LOTS OF TODDLER SHOES AND CLOTHING! 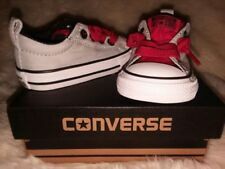 Converse All Star Chuck Taylor Infant/toddler Boys White/red Shoes~size 4 C. Condition is New with defects. Shipped with USPS First Class Package. The Converse® First Star crib shoes for infants are a mini version of the classic Chuck Taylor® hi-top All Star Core® shoes. They feature a canvas upper and a soft bottom. CRIB SHOES. Sizes US Crib - 4. Toddler Converse 4, Red. Condition is Pre-owned. Shipped with USPS First Class Package. Gently worn adorable shoes. There is a small spot on the back of the heel on the left shoe (as shown in the last picture). These are in like new condition. They were only worn a couple times because my daughter grew out of size 4 really quick!! Toddler Girls Converse Size 4. Condition is Pre-owned. Shipped with USPS First Class Package. Converse All Star Pink Baby Girl Size 4C !!! I have a pair of converse all star chuck Taylor toddler girls Glitter silver shoes, they are size 4 C. I don't have the box. infant/toddler,Kids and adult jordans, converse,stride rite and others. scratch on one toe. Converse All Star Blue Low Chuck Taylor Toddler Shoe Size 4 VGUC! Converses are a size 4 and are in good condition. Shoes are used and will show normal wear, however the overall condition of these shoes are "good".